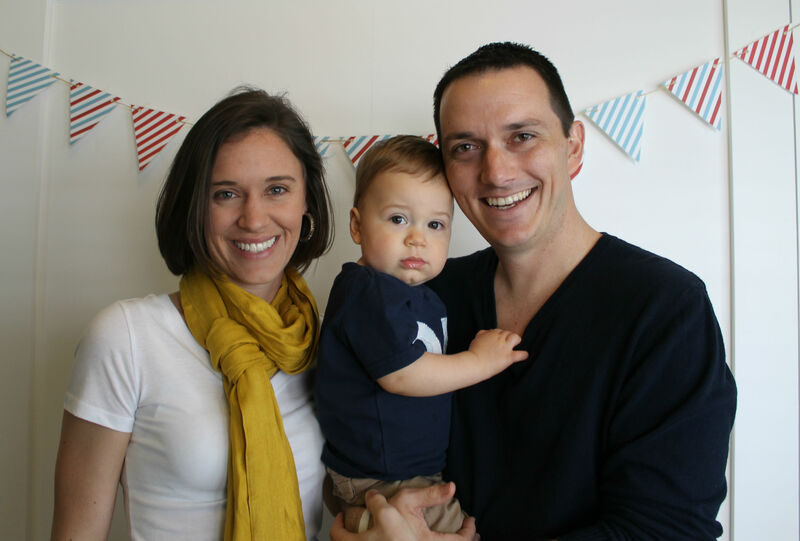 A year has flown by since Logan was born… I would have felt differently in those first few months of sleep deprivation with a nursing newborn, but looking back it seems like I blinked and he is a busy toddler. 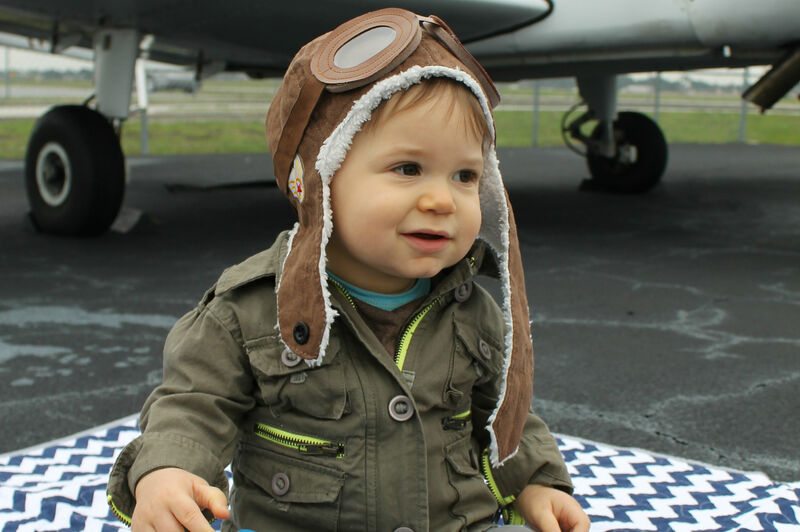 To celebrate his first birthday we went all out with an airplane theme. We have planes fly by our house many times each day and when he hears them now he points to the sky. While I was planning his party, I found lots of various takes on the airplane theme. I found these printables though and fell in love! You provide the child’s name, age and a few other details for the customization and voila! It does take some time and paper crafting to bring it all together but it is really worth it and the designer is great! We had these fun signs on the doors! And made a simple centerpiece for the tables under the tent by gluing paper party circles to craft dowels and sticking them in red pails. The sand weighted it down too, so they didn’t blow away. We put kraft paper down as runners and stenciled airplanes on with markers so that it would be easy clean up. 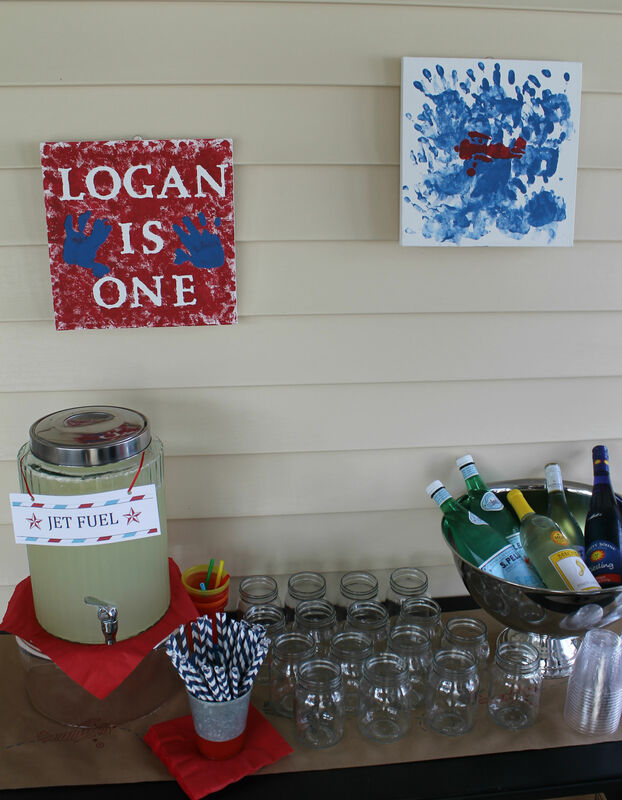 Another great part of the party printables was the customizable pennant banner. You receive the entire alphabet of individual letters and can spell out whatever you would like. 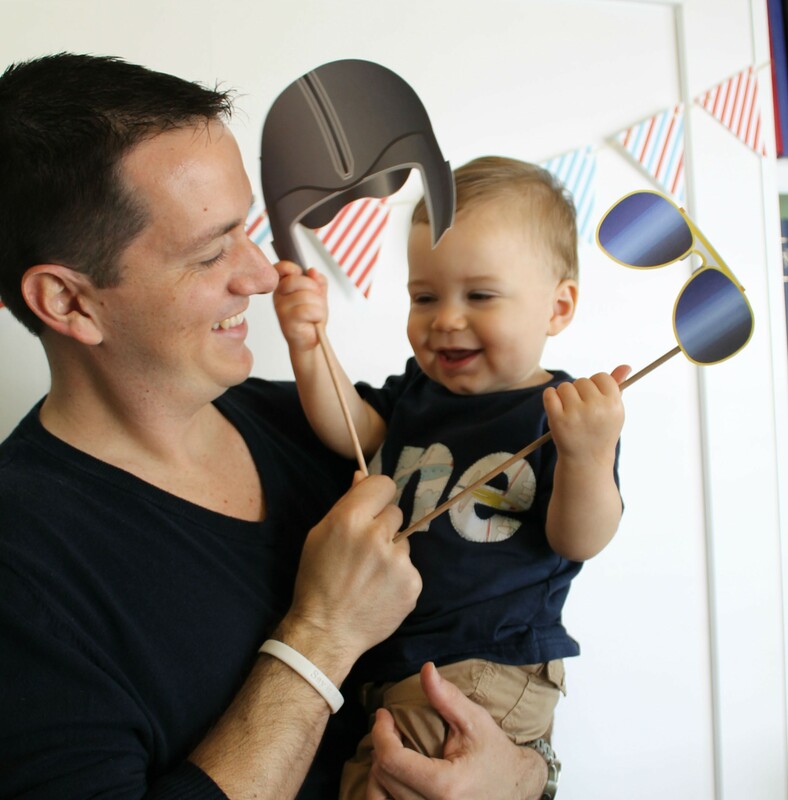 When guests arrived we had an aviation photo booth set up in our front office. Lots of cool props to pick from and a simple matching pennant banner for a back drop. We had some fun with letting the kids pick out the props for the photos too. You can find lots of photo prop packs online that you simply print and glue to sticks. In addition to the photo booth, we had a ball pit setup outside for our littlest guests. For the toddler and pre-school age children we had airplane coloring pages, bubbles and a paper airplane game. Truth be told, I think the dads were the ones playing with the paper airplanes but it was fun for every age! We had hung wreath forms wrapped in crepe paper outside so that you could give your paper airplane a test flight. We also hung a “chalkboard” outside in the tent so everyone could see Logan’s stats and favorite things. It was made from black foam board and metallic markers. Easy to do using a ruler as a guide for spacing and you can customize it exactly like you want it. I wanted people to see his favorite foods and activities. Everyone always wants to know how much your child weighs and how tall they have gotten. The options are endless so have fun with it! We had our food & drink setup outside on the back patio. To keep with the airplane theme, we had an assortment of JJ’s subs, bags of PopCorners chips and whole fruit. People could put together their own lunch. 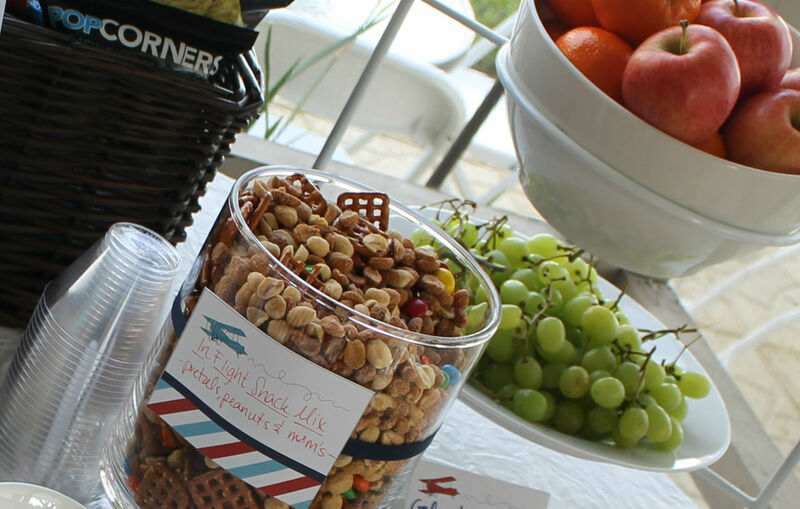 We also had an “In-Flight Snack Mix” with pretzels, salted peanuts, honey roasted peanuts, dark chocolate M&M’s and peanut butter M&M’s…it was a big hit! We had “Jet Fuel” to drink, also known as lemonade. Above the table we hung two small canvases that we had made with Logan in the weeks prior to his party. For the canvas on the left, we put large letter stickers on the canvas and sponged over them with paint. After drying, we did Logan’s hand prints in blue and peeled off the letters to reveal the writing. For the other canvas, we dipped his hand in paint and stenciled all over with it. Later, Mommy stenciled on the red plane to tie it into the party theme. We set up a dessert table inside with cake pops, cupcakes and sugar cookies. It is a great assortment for guests to help themselves and no cutting is required! If you want to try some or all of these desserts for a party of your own, plan ahead and complete things in stages. The cookies were baked and then frozen until the day before. 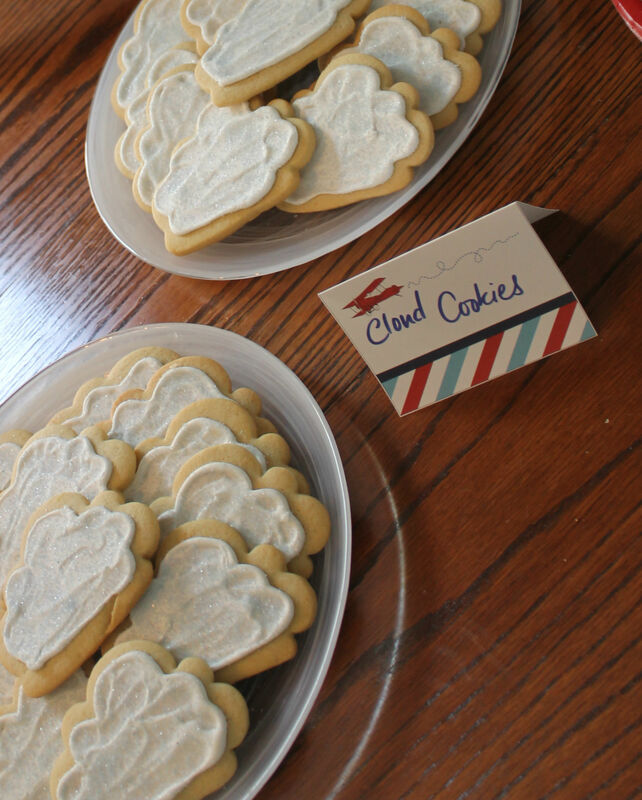 I thawed them and decorated them with a basic royal icing and light blue sugar. For the remaining items, I formed the cake balls ahead and froze them, as well as, the cupcakes. 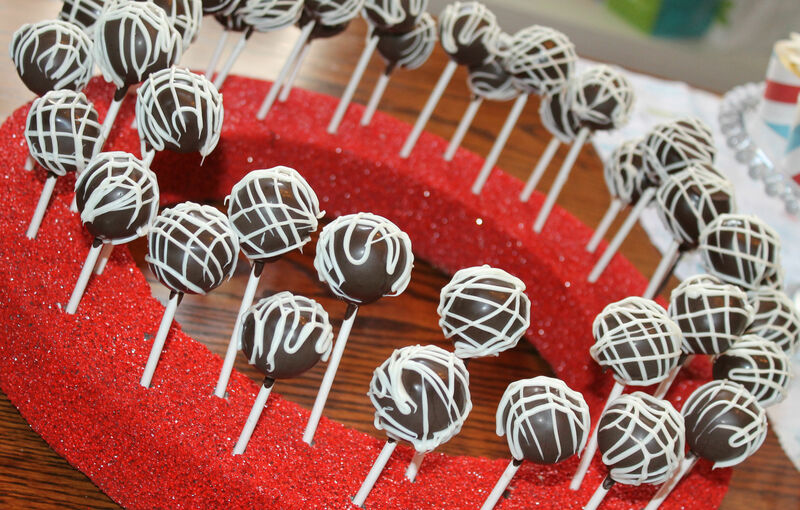 The day before the party, the cake balls were dipped in coating chocolate and the buttercream was made to pipe on the cupcakes. 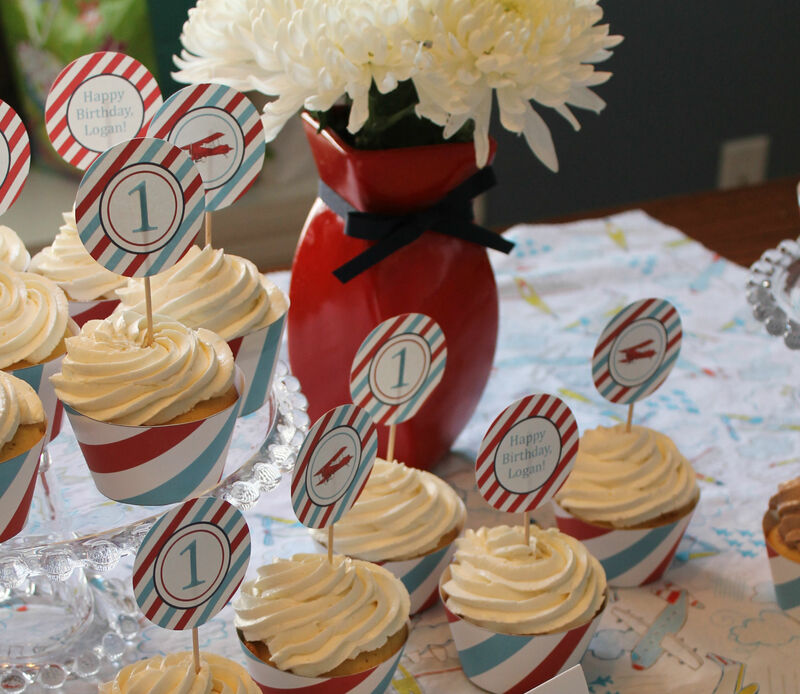 The cupcake wrappers and toppers were a part of the adorable printable pack. You simply print, cut, and tape or glue. 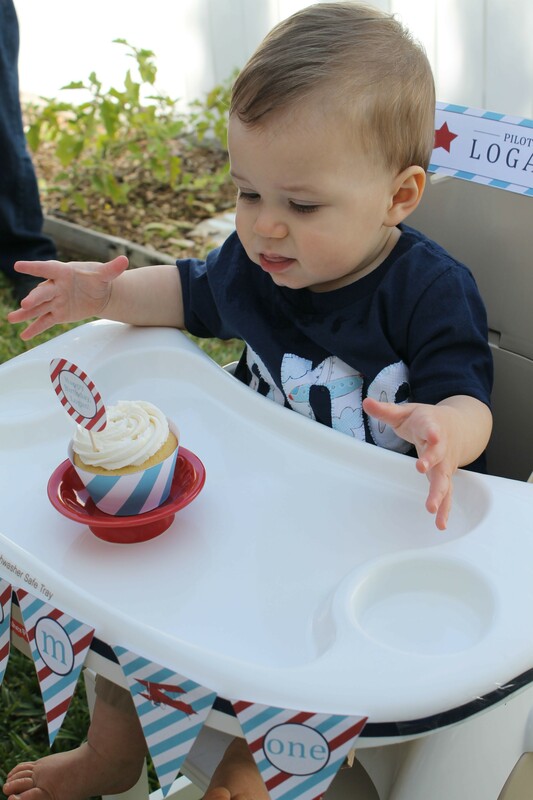 The big moment that everyone waits for at a First Birthday..the cake smash or in this case, the cupcake smash! Unfortunately for our guests, he was quite clean afterwards and really didn’t see what the fuss was about. He had a few finger fulls of buttercream and a crumb of cupcake before he threw in the towel. Oh well..there will be plenty of treats in his future! We sent our guest aviators home with “luggage” bags with goodies. We had aviator rubber duckies, foam gliders, sunglasses and cards in each one. 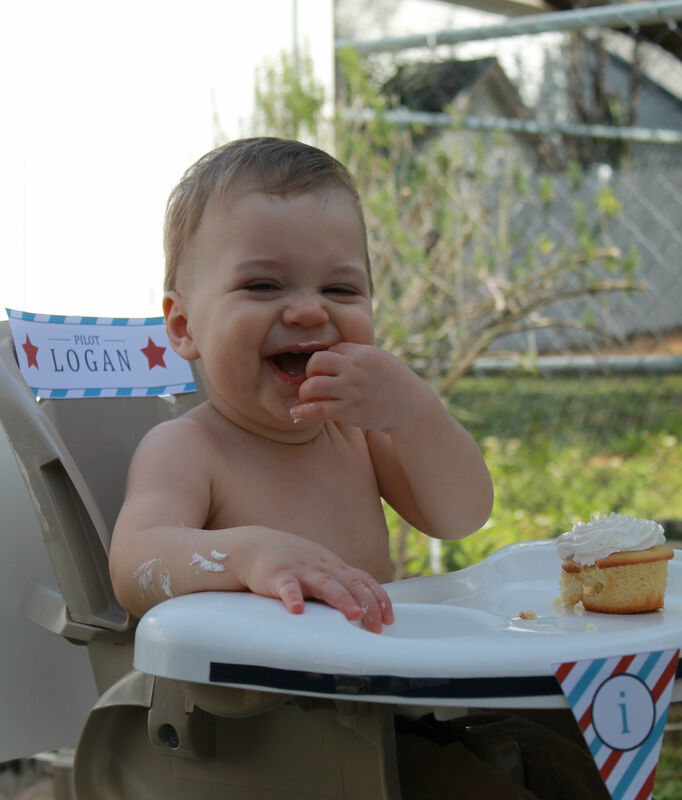 19 Responses to "Pilot Logan’s First Birthday"
Thank you Wendy! It was fun to do! Thanks Maida! He sure was a happy little boy that day! Logan is a lucky little boy! Agreed! But I think we are even luckier to have him as ours! Great party ideas. Fun family! Happy Birthday Logan!! I love it, very cute! 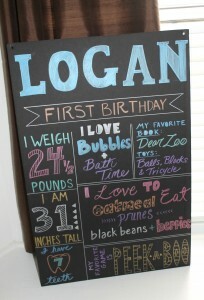 Happy Birthday Logan! Thanks Jessica! Hope your little guy is doing well! Wow! A year already! Love the theme and the decorations ..good job! happy birthday Logan! It’s hard to believe…time really does fly by! Thank you! It was a labor of love! Great ideas and great job for a wonderful celebration. Thanks Dianne! We enjoyed you celebrating with us! What a perfect party. Wish we could be closer to celebrate these awesome events. Love you. Thank you Vicki! We wish you all were closer too! 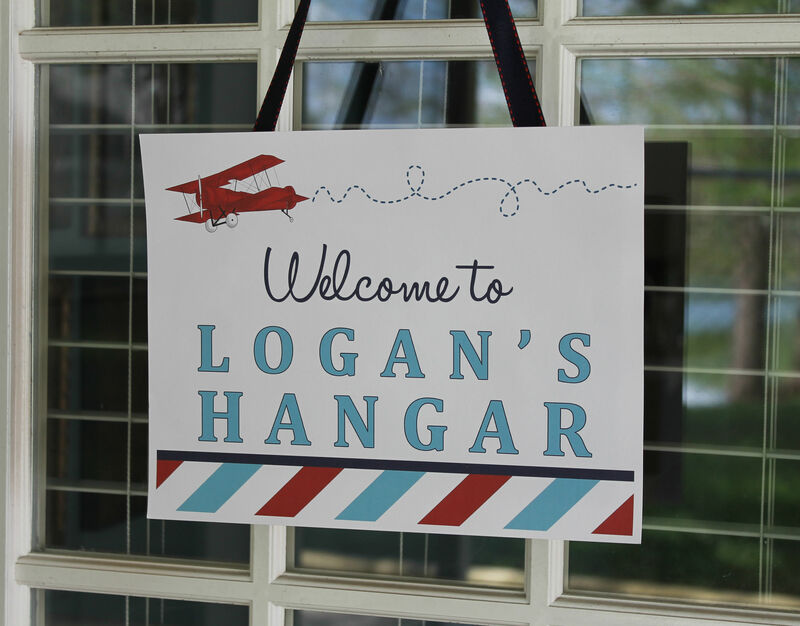 It was a great party and Logan was a first class Pilot!!! That picture should be saved and put in his senior yearbook!!! I know it’s early, but it will be here before you know it!!! Love you all!!! I will definitely put it aside for future use! Good thought! It’s fun to see these pictures again. Very creative! Enter your email address to subscribe to Soy and Sugar and receive notifications of new posts by email.